Matteo Penzo: rants and rumblings on my view on life, business and other amusements. Here’s the cover of the first book (also available for download in electronic format) from my pal Simone. It’s actually my present for Christmas and his birthday: it’s been a tough work which involved his girlfriend (who took care of the editorial stuff) and our friend Livio (who created the wonderful artwork for front/back covers. Francesca’s gone through the whole Taxiguerrilla archives (nearly 3 years of writings) and has chosen the best pieces, then reorganized them in a form suitable for a book. The book (Italian only) is self-published and available for FREE download (Simone is takin a full review of the book, so it’s not available anymore. Stay tuned.) 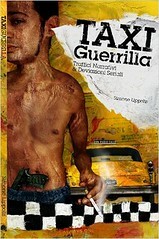 on taxiguerrillathebook.hotmc.com; a preview (PDF file) is available here. This entry was posted in Beef and tagged blog, life, personal by admin. Bookmark the permalink.